Because I've found the teaching really, really fresh and really, really full of hope. Which is just a pretty cool combination. I mean, I'm not sure what images would come to your mind if someone said the words 'The City and Eco-Mission'… But I honestly had no idea what to expect. Because our lecturer was drawing out some responses to the undeniable fact that around one fifth of the world's population live in slums in majority world cities. These people are deeply affected by the environmental crisis that comes with this type of urbanisation. And in many of these locations it is where the Pentecostal or charismatic church is growing the fastest. Yet, our theology doesn't always seen to make a tangible difference. There can be a disconnect. We talk about a hope of heaven (which is awesome, and true and totally right!) but we should also believe in a God who is interested in today. And a God who calls His people to make a difference. In the actual world. Because in Him, there is no disconnect. Even in our own immediate communities, we now see the main public health issues affecting those we know and love and work with as obesity, mental health, drug abuse and domestic violence. I know in my context that is true. And responding to these social contexts means engaging creatively with these communities. Using space. Using greenspace. Starting at a local level that engages and empowers individuals and then working-out from this to have a bigger impact. The point that really struck me amongst so much material was the description of Jesus as both Creator and Redeemer. That the Holy Spirit who fell at Pentecost, is the same Spirit of God who hovered over the waters at creation. And that changes the way that we can sometimes make receiving the Holy Spirit solely about us and our personal experience. Because it is about that. That is fundamental. But it doesn't end there. Because we have a responsibility to bring the Shalom and Beauty of Yahweh into the world. Through us. I harp on about justice issues all the time. But it was challenging today to start to look at justice issues in terms of land, and the world, and the creational sins that I have actually been really ignorant of. And for all the fresh teaching and discussion, my favourite part of today was actually this afternoon. Because this afternoon we went to see these lectures-in-action by visiting Possilpark in Glasgow and spending time in this area where an amazing church plant are really putting this stuff into their community experience. Their heart for their community, their love of their community, their faith for the resurrection of God in their community… It was just inspiring. Because in their actions they are loving people and engaging them in church through eco-mission. They are reclaiming community ground and transforming things physically, even as they pray for continued spiritual transformation. It is a stunning way of doing mission. And as we finished our tour of Possilpark, we stood on top of the clay pits, a piece of land that this church has been using as an outside-base for many community events. We could see this stunning panoramic view of the whole of Glasgow-at-night. We prayed for this city. We prayed for our own cities. I prayed for Sapporo, my soon-to-be city. We prayed with faith. And as we finished our time of prayer we shouted out 'Come Lord Jesus!' at the top of our lungs over the cityscape beneath us. Seven looking-kind-of-crazy Christians believing with faith that Jesus is the one who can resurrect the city. The cities. The world. I really do like praying on top of hills 🙂 And I am so thankful for Jesus, who has already shown He is the One who holds resurrection power, and invites us into this adventure with Him. Ok. I have two photos you might appreciate. 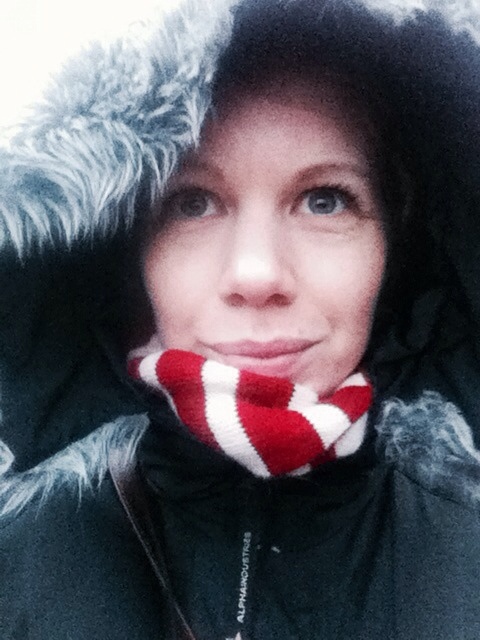 1) Me appropriately dressed for Glasgow weather!